Image courtesy of Cogeneration Technologies. Coal is not the cleanest source of hydrogen and it is not renewable like solar and wind energy are, but its abundance and practicality have made it the short- to mid-term solution in President Bush's $1.2 B hydrogen initiative. At its current consumption, America has a 250-year supply of coal, though much of it is "dirty", containing environmentally harmful impurities such as sulfur, hydrogen sulfide, arsenic sulfide, and heavy metals like mercury. In his energy plan, Bush admits, "...coal presents an environmental challenge. So our plan funds research into new, clean coal technologies." Steve Benson, a Senior Research Manager at the University of North Dakota's Energy & Environmental Research Center (UNDEERC), is leading some of that research. He explains that "some of the best coals have been used" and it is unknown how dirty some of the reserves are. With coal-related environmental issues becoming increasingly important, Benson appeared before environmental senate staffers this summer to brief them on mercury control technologies at coal plants. While it is still not an environmentally-safe ideal, clean coal is very different from the coal burnt during the industrial revolution. Simply burning coal is less efficient and incredibly hazardous to the environment: sulfur and nitrogen oxides, as well as the greenhouse gas carbon dioxide are released in large amounts. A modern method to release coal's energy is the two-step steam reforming process. In the first step, a carbon unit of coal reacts with steam to produce hydrogen and carbon monoxide. In the second step, carbon monoxide further reacts with steam to produce carbon dioxide and more hydrogen. Not considering impurities, coal and steam yields hydrogen and carbon dioxide as well as heat, which is used to make some of the required steam. Because the greenhouse gas carbon dioxide is a product, the process is not environmentally sound if the gas is simply released to the atmosphere. Fortunately, unlike with gasoline-driven cars, coal plants are a centralized source of carbon dioxide, which makes it possible to collect and hold the gas. The U.S. Department of Energy is funding research into this essential step. Carbon dioxide can be sequestered into geological formations such as oil or gas reservoirs in a process called advanced oil recovery. Pumping carbon dioxide down to the reservoirs pushes oil upwards and increases production. Though under research, this method is already in use in Canada and the United States. Advanced oil recovery is essentially trading something unwanted for something wanted; however, there are risks. Benson cautions this cannot be done at any oil or gas reservoir and that the area has to be geologically stable and far from any fault line. "There are some huge questions: are you going to have a burp of carbon dioxide released?" Instead of struggling with ways to sequester all of it, Steven Bergens, a catalyst and fuel cell researcher at the University of Alberta, predicts that since carbon dioxide will be such an abundant chemical, there will be intense research to find something useful to do with it. Just as glass is made from sand, maybe one-day something like road material will be made from carbon dioxide. Gov. 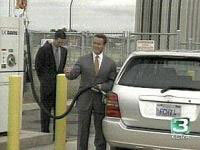 Schwarzenegger fuels a hydrogen fuel cell Toyota. Image courtesy of KCRA News. Clean coal technology will also have to minimize the amount of carbon monoxide byproduct. It is not only poisonous for humans, but also for the catalysts in fuel cells. To produce hydrogen on the scale needed to replace gasoline in the transportation industry, absolute purity will not be economical. Bergens explains that both sides are working on the problem of impurities: hydrogen producers and fuel cell researchers. A fuel cell may have a good lifetime with pure laboratory-grade hydrogen, but, "it's going to take some work to develop fuel cells that tolerate impurities." The Department of Energy is funding research into these and other areas of clean coal technology. On August 12, 2004, U.S. Secretary of Energy Spencer Abraham announced $3.4 million in funding this year for 22 universities in the University Coal Research (UCR) program. The program began in 1979 and has funded approximately 675 new research projects with a combined value of almost $113 million. Current projects include a new way to store hydrogen at Alfred University in New York. Light-activated glass microspheres could be a safe and lightweight storage solution in vehicles. A group at the University of Texas at Dallas is developing new membranes that will purify hydrogen by removing carbon dioxide. The University of Connecticut is studying ways to transform trace heavy metal impurities like mercury and arsenic into less harmful forms. In a project at Southern Illinois University, sulfur oxides from de-sulfurization scrubber materials are combined with renewable agricultural by-products to make a cheap alternative to wood products. All of this research will make clean coal technology a more environmentally friendly and efficient source of hydrogen for the near future. Research and development itself requires energy, the current source of which is oil. Therefore, the energy technology to replace petroleum has to be developed and implemented before petroleum becomes prohibitively expensive to even research an alternative.